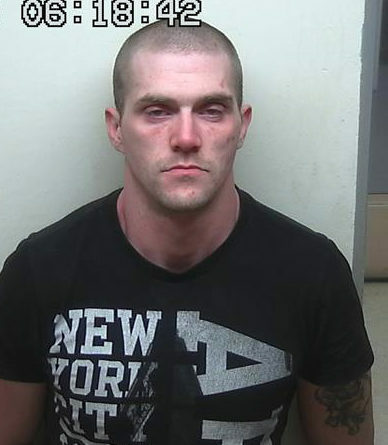 Maynard Hardison, 30, of Sullivan, was charged early Tuesday with reckless conduct, aggravated criminal mischief, eluding an officer and operating a motor vehicle after a habitual offender revocation. Police chased a Hancock County man eight miles late Monday night before he abandoned his vehicle on foot and police finally found him inside another vehicle in Sullivan. Maynard Hardison, 30, of Sullivan was charged early Tuesday with reckless conduct, aggravated criminal mischief, eluding an officer and operating a motor vehicle after a habitual offender revocation. State police used a tracking dog and called in help from the Hancock County Sheriff’s Office and Maine Marine Patrol during the 3½-hour pursuit, police said. The incident began at about 8:50 p.m. Monday, when Maine State Police Sgt. Jason Sattler tried to stop a vehicle that he suspected was stolen on Tunk Lake Road, also known as Route 183. Sattler also suspected Hardison was the driver, that he was under the influence of drugs and that he lacked a driver’s license, police said. The pursuit began after the vehicle didn’t stop when Sattler activated his cruiser’s lights, according to police. At one point, Hardison drove the vehicle into a snowbank and hit Sattler’s cruiser as Hardison managed to free it from the snow, police said. Hardison eventually lost control of the vehicle near a private road and Ashville Road, which is off Route 1, and ran into another snowbank. He then ran from the vehicle, and police called in a state police tracking dog and handler. The pursuit ended and Hardison was arrested at about 12:22 a.m., after Marine Patrol Warden Jonathan Varnum stopped another vehicle and found Hardison inside. Hardison is due in Hancock County Unified Criminal Court at 1 p.m. Wednesday, officials at Hancock County Jail said.